Conjure up the subtle flavour of Mediterranean cuisine. Succulent small courgettes to be picked at golf ball size and upwards. 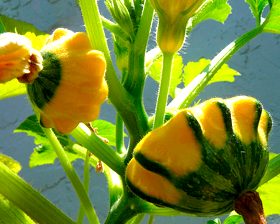 Courgette Baby is deliciously different, with a flavour all of its own. Eat raw, stuffed or boiled in lightly salted water. Sow seeds in spring 1cm deep in a good seed compost. Germination usually takes 6-10 days at 24C.